Yep, you read that right. Free daily spa treatments - all included in the price of your accommodation. Luxury resort Fusion Maia in Da Nang (Vietnam) offers its guests complimentary unlimited spa treatments every day - although during busy periods, this is capped at (a guaranteed) two treatments per person per day. Given our dedication to you, our readers, we took one for the team and decided to investigate this holy grail of vacations. The resort is only 10 minutes away from the airport, and has an open, airy architectural layout resembling Huế, the imperial city only two hours away. The walkway leading down to the resort's infinity pool, which overlooks the beach. The one bedroom villa we stayed in was similarly open-plan (so expect less privacy in the bathroom! ), with a rainforest shower and a dark granite bathtub that looked out towards our private swimming pool in an enclosed backyard. A standard, one bedroom villa. An open bathroom means that your accompanying boyfriend/girlfriend may see/hear things they never needed to see/hear. Dark granite bathtub full of fresh lemongrass, mint and lime, along with a bottle of prosecco. Each villa comes with its own private, enclosed swimming pool and an outdoor shower. Having tried two spa treatments a day during our entire stay, I would highly recommend the Aromatherapy Facial (the soothing smell of lemongrass is sure to lull you to sleep - and your skin will look visibly brighter when you wake up), the traditional Thai Fusion massage, a manicure (which lasted for a full two weeks afterwards without any chipping), and for the pain-tolerant, the Super Slimmer Massage (expect to be pummelled and slapped in the arms and stomach - with visible results though). The only treatment I would not recommend is the coconut wrap, which involved being cling wrapped with some coconut milk and cloves for 45 minutes - an uncomfortably cold and not particularly effective experience. We opted to do tai chi on the nearby Marble Mountains (ngũ hành sơn) around 10 minutes drive from the resort with our tour guide, Phuong. The Water Mountain is the only one out of the Marble Mountains that is accessible. Be prepared to walk up many steps to get to the top! Marble Mountains consists of five mountains named after metal, wood, fire, water, and earth. The only summit accessible to tourists is the Water Mountain, which holds two large towers - one to view the city, and one to view the ocean - as well as quaint pagodas with buddha statues. After walking up around 150 steps, we peeked into the mountain’s cave (known as the cave of hell) before walking through a stone gate dotted with bullet holes from the Vietnam War to the other side of the mountain for our 45 minute tai chi class, facing a panoramic view of the surrounding area. Enjoy a spot of tai chi on Marble Mountain. Another activity that Fusion Maia offers is private yoga classes (an added cost), in your choice of the open-air beach pavilion or the yoga studio - or if you’re not keen on paying extra but still want to get a fitness class in, there are also complimentary morning fitness yoga classes. These sessions are a combination of high energy fitness transitions and warrior yoga, including moves like the “tiger walk” (similar to a bear crawl), frog squats with our arms splayed out to the side, cobra push ups, acro-yoga, and a few combinations of Thai-style knees and kicks on a punching bag. Acro-yoga with my instructor, Phuong. Fusion Maia also very conveniently offers free shuttle buses to the nearby UNESCO World Heritage Site of Hội An. 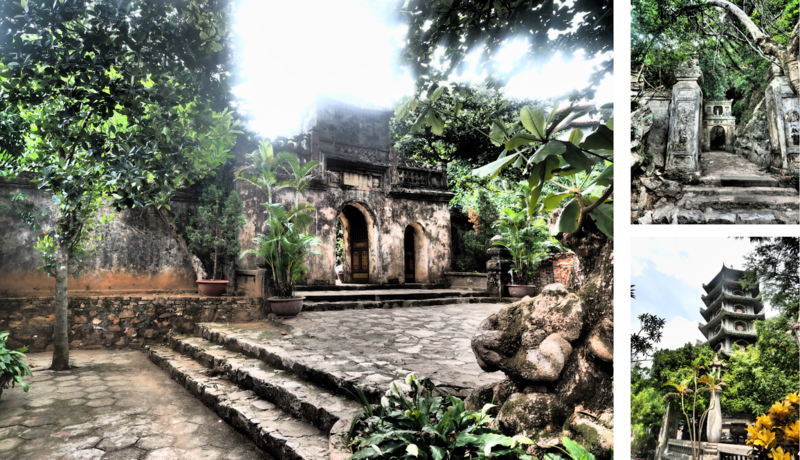 Check out our Top 5 Things to Do in Hoi An article for more info. One of the things we loved best about Fusion Maia was that it offers its guests a choice of either a breakfast buffet at the Five Dining Room in the morning, or alternatively, all-day breakfast by the pool, in your room, at a location anywhere on the resort (including on the beach or at the lounge bar), or even in the nearby town of Hội An. As Gillian Hamilton, the General Manager explained, “Our concept for breakfast is any time, any place - literally. This is especially important if you have travelled a long way and you wake up at some crazy time due to jet lag - you can have your breakfast whenever you want. You can select one of five set menus to eat anywhere on the resort property, including on the beach. The Vietnamese set menu (above) included an assortment of pastries, a bowl of fresh pho, a sweet snack, fresh juice and Vietnamese iced coffee. The buffet has a diverse range of food with numerous healthy options, including a range of fresh fruit juices and smoothies, different types of compotes to make your own yoghurt parfaits, homemade granola, and fresh fruit. In addition, the buffet had a choice of traditional Vietnamese food, including pho noodles and mi quang (which looked similar to laksa), and a wok noodle of the day accompanied by a selection of fresh herbs, as well as Western food such as customised omelets, and other Asian cuisine including har gau, congee, and wok fried bok choi. One main (cooked to order) can be selected with the buffet breakfast. (Left) Poached egg with asparagus on top of a bed of smoked salmon. (Right) Grilled teriyaki salmon with spinach. On top of the choices at the buffet, each person would select one main dish from a range of options, including salmon teriyaki, soba noodles, American pancakes, and crepe topped with crumble. The meal included unlimited tea or coffee, so we opted for the traditional iced Vietnamese coffee (cà phê sữa đá) with condensed milk in a short glass - the perfect balance of cocoa and nutty flavours to kick off our day. For dinner, we would recommend Fresh restaurant, which overlooks the resort’s infinity pool. The two standout dishes were the grilled squid with a wonderfully tart and spicy dressing, and the chicken curry baked inside a coconut. The grilled squid was absolutely delicious! Flights from Hong Kong to Da Nang run at least daily on Dragon Air, and cost around HK$2,800 (including taxes) return, depending on the season. Rates at Fusion Maia start from around US$420 per night for a standard pool villa, inclusive of spa treatments and all-day breakfast. If you're the organised type (or want to make sure you have particular timeslots), make sure you book your spa treatments in early. While they say your first day's treatment can be booked in advance and then your subsequent treatments should be booked upon arriving at the resort, you can always ask your Fusionista to book you in for everything before you arrive. Get up to watch the sunrise over the beach. It's beautiful, and you can get some amazing pictures! Bring over a bottle of booze in your suitcase and ask the resort for some wine glasses to be sent to your room. Chill out in the granite bathtub or out in your private garden over a glass of vino, without having to pay a premium!